INTRODUCTION: Periostin (Postn) is a secreted cell adhesion protein that activates signaling pathways to promote cancer cell survival, angiogenesis, invasion, and metastasis. 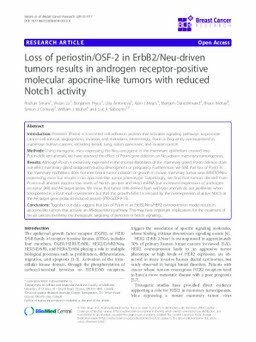 Interestingly, Postn is frequently overexpressed in numerous human cancers, including breast, lung, colon, pancreatic, and ovarian cancer.METHODS: Using transgenic mice expressing the Neu oncogene in the mammary epithelium crossed into Postn-deficient animals, we have assessed the effect of Postn gene deletion on Neu-driven mammary tumorigenesis.RESULTS: Although Postn is exclusively expressed in the stromal fibroblasts of the mammary gland, Postn deletion does not affect mammary gland outgrowth during development or pregnancy. Furthermore, we find that loss of Postn in the mammary epithelium does not alter breast tumor initiation or growth in mouse mammary tumor virus (MMTV)-Neu expressing mice but results in an apocrine-like tumor phenotype. Surprisingly, we find that tumors derived from Postn-null animals express low levels of Notch protein and Hey1 mRNA but increased expression of androgen receptor (AR) and AR target genes. We show that tumor cells derived from wild-type animals do not proliferate when transplanted in a Postn-null environment but that this growth defect is rescued by the overexpression of active Notch or the AR target gene prolactin-induced protein (PIP/GCDFP-15).CONCLUSIONS: Together our data suggest that loss of Postn in an ErbB2/Neu/HER2 overexpression model results in apocrine-like tumors that activate an AR-dependent pathway. This may have important implications for the treatment of breast cancers involving the therapeutic targeting of periostin or Notch signaling.